How about homemade Easter buckets for an Easter basket craft? Every year for Easter I have the children make their own baskets or buckets for that year's Easter Egg hunt. It really is quite simple. I purchase sand buckets in different colors and will help the children with the project as they are only five years old. I draw an outline of eggs on the buckets and write the kids names with the paint. After the paint dries, the children then paint the eggs and decorate with foam stickers. I use the ribbon to tie on the handles of the buckets. We use these for Easter Egg hunts only, they have different baskets for Easter Sunday. Thanks for a very cute and creative Easter basket craft idea. 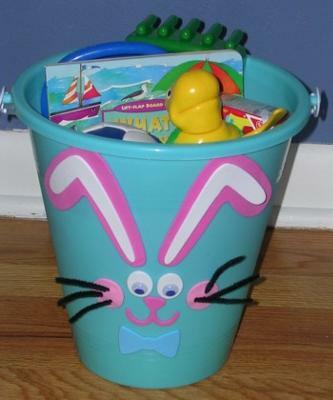 I'll bet the kids love designing their very own bucket or basket for the Easter egg hunts! I love that you take the time to get the kids involved rather than just give them a finished Easter bucket to join in the hunt. You're creating wonderful memories of childhood that you and your kids will remember and cherish forever. I hope you'll pop in often and share more creative ideas, for Easter or any time of year.